A neat new angle on life in Palestine. Great characters and drama both on and off the track. It’s a scrappy piece of work, but all the more fascinating for it. There’s something hearteningly ramshackle about Amber Fares’ fly-on-the-dashboard documentary which glances into the lives of a Palestinian, all-female motorsport team. It certainly puts paid to F1 chief Bernie Eccleston’s recent remarks that women driving cars just look “silly”. There are rivalries and tantrums, heroes and villains, but the material remains loosely episodic, never forcibly cobbled into a standardised sports movie arc. So where the structure of a multi-race championship gives the film its basic momentum, Fares is just as interested in looking into her characters’ equally-eventful personal lives. Marah, Mona, Betty and Noor are the chosen protagonists, front and centre being the antagonism between glamorous media darling Betty, and homely, modest Marah. It soon becomes obvious that Speed Sisters can’t offer a conventional sports movie narrative due to the tumult of extenuating political circumstances, and it’s this surfeit of small barriers which make the movie so compelling. The problems of your practice track being located in a spot which may mean having to dodge flying tear gas canisters gives some idea of what these women are up against. And then you’ve got the tide of cultural conservatism that dictates that what these women are doing is offensive and they should really all be working as nurses. And on top of that, the sports federation in which the women are competing (run entirely by men, of course) is corrupt to its marrow, with rules literally being created and justified via personal whim. It’s always the background detail that’s most interesting – the drama comes from the women actually getting to the track, not from their activities at the track itself. The film avoids directly discussing the fraught and violent political situation, though Fares makes sure its evident in every frame. 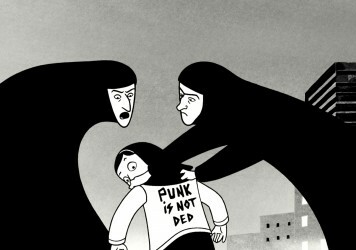 Marjane Satrapi comes straight out of the underground and socks it to the big boys.